Zimbabwe’s liquidity crisis continues to worsen six weeks on from its contested elections. While local financiers admit that they’re treading cautiously, there is a view that the UK could lead efforts to re-engage with the beleaguered country. “President Emmerson Mnangagwa was expecting significant international goodwill and investment after the election, yet the post-poll crackdown and resulting international condemnation has dampened such hopes,” writes Oxford Analytica in its Daily Brief. One blow came earlier this month at the 2018 Beijing Summit of the Forum on China-Africa Cooperation, where Mnangagwa failed to secure the US$2bn Chinese bailout he had sought. According to the Zimbabwe Independent, Zimbabwe’s ministry of finance has for some time been negotiating for a loan from the Industrial and Commercial Bank of China and the Export-Import Bank of China, but “a breakthrough has been slow in coming because the Chinese remain worried about Harare’s ability to repay loans”. Instead, in China, agreements were reached on immigration and Zimbabwe received a commitment by the Chinese to import citrus fruit and donate 500 boreholes. Financiers, who had been keeping an eye on the elections, maintain a restrained outlook. “With any government that’s changing, we tread cautiously,” said Mark Hing, trade syndication specialist at Absa Group, speaking at an event in Cape Town in early September. According to John Lentaigne, chief underwriting officer at the African Trade Insurance Agency (ATI), investors are spooked by two particular challenges other than the country’s regime change. The first is around certain US sanctions, “which make finance incredibly tricky and slow down the ability to transact”, he said, speaking at the same event. Although Lentaigne noted that there wouldn’t be an “overnight fix” to these issues, he did concede to a growing sense of optimism. “Everyone is expecting Zimbabwe’s prospects to look up over the medium term,” he said. President Mnangagwa promised “radical economic reforms” at his inauguration last month, which came weeks after his violently disputed election. The new government is targeting annual economic growth rate of at least 6% over the next five years, planning to attract US$5bn in foreign direct investment (FDI) and US$10bn in domestic investment a year. Specialist intelligence company EXX Africa calls the goals “unrealistic”, pointing out that the IMF expects Zimbabwe to grow at an average of 4.2% a year through 2022, while according to the UN, the country secured just US$89mn of FDI last year. On September 7 Mnangagwa announced his new cabinet, which local news reports have dubbed an “average” team as it features ministers “dogged by allegations of corruption, while in some cases the appointments were based on patronage and factional considerations”. Nevertheless, the appointments include that of renowned financial expert and former African Development Bank chief economist and vice-president Mthuli Ncube as finance minister. Despite Mnangagwa’s vow to pursue economic reforms under his new mandate, he is facing a “worsening fiscal crisis and a resulting inability to pay for imports”, the consultancy says. Zimbabwean milling companies have been forced to suspend operations because the government has been unable to source the foreign currency to pay for thousands of tonnes of wheat being held up in a Mozambican port. A final payment was reportedly due by the Reserve Bank of Zimbabwe (RBZ) to overseas supplier Holbud Limited on Friday. The country is also facing a cement shortage. A statement released by the Cement and Concrete Institute of Zimbabwe earlier in the month indicates that the industry may not be able to cope with rising demand unless foreign currency shortages were addressed to reduce plant downtimes. “State-aligned newspapers have tried to claim that this increased demand indicates the economy is rebounding, but this ignores the RBZ’s inability to source funding for imports,” says Oxford Analytica. More alarmingly, Zimbabwe’s pharmaceutical sector, which relies largely on imports, has resorted to drug rationing as stocks have fallen to unsustainable levels due to delays in paying foreign suppliers. The liquidity crisis remains a major constraint on growth and deterrent to investment, explains Robert Besseling, executive director of EXX Africa. But he believes that when foreign money does come, it is likely that UK investors and businesses will be at the forefront of re-engaging with Zimbabwe, “potentially at an initial advantage over more cautious European and US counterparts”. His reasons are manifold: the UK government has been far less vocal in its criticism of the legitimacy of the elections; the relationship between the UK and Zimbabwe has warmed in the wake of the UK’s Brexit vote; and the UK is actively promoting debt write-offs in exchange for a commitment to reform (contrary to IMF and EU advice). “Despite the disputed and tainted elections, it is unlikely that the UK will change its stance towards Zimbabwe,” says Besseling, referencing a deal signed by the CDC, the UK’s development finance institution, earlier this year, in which it agrees to share the risk with Standard Chartered on a US$100mn loan to companies in Zimbabwe. “The decision was perceived as a clear endorsement of Mnangagwa’s economic policies,” he says. 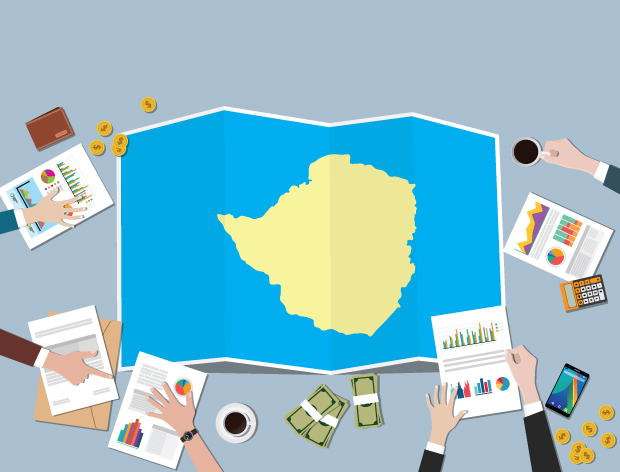 The UK government’s support for the new Zimbabwean government “should mitigate some of the concerns over Zimbabwe’s balance of payments and reputational risk following the violent elections”, Besseling adds.